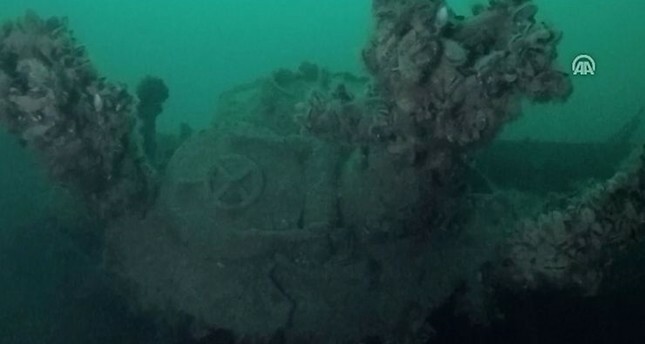 The wreck of a German U-class submarine that sank during World War II was found off the coast of Ağva in Istanbul's Şile district during a documentary shoot, reports said Friday. The U-23 submarine was lying at a depth of 40 meters off the Black Sea coast, two nautical miles (3.7 kilometers) away from the shore when it was found by the TCG AKIN search and rescue submarine and scanned the submerged warship with remote controlled devices during an underwater documentary shoot jointly conducted by Turkey's public broadcaster TRT and the Turkish Naval Forces. The submarine is one of the six U-boats (U-18, U-19, U-20, U-21, U-22, U-23) nicknamed "Hitler's lost fleet." Hakan Aslan, director of the documentary named "Mavi Tutku" (Blue Passion) said that they have long been researching the area for the documentary. "We have been working on German submarines' operations in the Black Sea for a long time. The documentary, which we have been preparing with the help of submarine personnel as well as the narratives of eyewitnesses, will premiere soon," Aslan said. The TCG AKIN submarine, which made the discovery, participated into Turkish navy in 2018 and has advanced underwater search devices including a remote controlled camera that can operate at up to 1,000 meters depth. The commander of the TCG AKIN Cenk İlgün said they were happy to discover the warship that had long disappeared in the depths of the Black Sea as it was an important witness to an important era in history. The 40-meter-long U-23 is the second German submarine found off the Turkish coast. On July 13, 1994, the Turkish Navy's TCG rescue submarine found a German U-20 at a depth of 23 meters off the coast of Karasu district in Turkey's northern Sakarya province. The third boat, U-19, is believed to be off the coast of northern Zonguldak province, while its exact whereabouts remains unknown. During World War II, Nazi Germany requested permission from neutral Turkey to use the straits to transfer their submarine fleet to the Black Sea with the aim of using them in the Operation Barbarossa, the invasion of Soviet Union also joined by their Romanian allies in 1941. The straits were closed to military vessels under the Montreux Convention, therefore the Germans had to carry via land and the Danube the pieces of six submarines, including a U-23 and U-20, from Germany's Hamburg to Romania's Constanta where they rebuilt the vessels. The vessels, which were named as the Kriegsmarine's 30th Flotilla, carried out 56 operations against the Soviet Navy from Oct. 27, 1942 to Aug. 25, 1944, when the Red Army captured the German naval base in Constanta. By this time, three U-boats were sunk by the Soviets during sea battles. Germany requested for the second time from the Turkish government to open the straits for its three remaining submarines, however their request was denied again on the grounds of the same convention. Following the refusal, the German navy had to scuttle the submarines and the personnel disembarked on Turkish soil. They were interned in Turkey for over a year before returning home following the war. Turkey remained impartial for most of WWII until it declared war on Germany in February 1945. Both countries' militaries, however, never confronted each other before the Germans surrendered to the Allies less than three months later.